Consider it a soft launch for Igloofest's ninth edition last night (January 16): at the Quai Jacques-Cartier, Gui Boratto played a balanced, if not subdued, set. Not that there's any way of controlling the weather, but when the mercury goes below -30 and you're dancing outdoors beside a body of water, you need a tempo that keeps you moving at all times. However, Boratto's not about those ostentatious buildups and "sick drops," preferring to maintain a nice minimal tech house groove throughout; his buildups are subtle, taking you on a journey, not a trip, and all the brave souls in attendance seemed ready to take it with him. 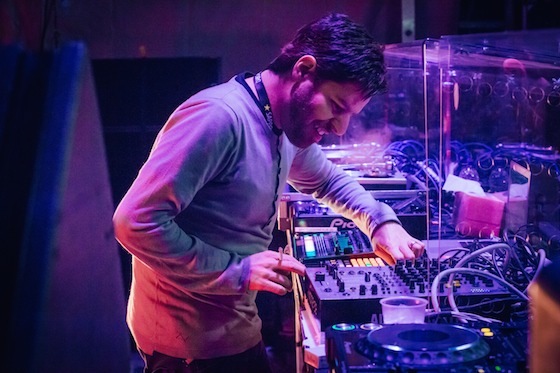 Those who've seen Boratto perform live probably recognized a large portion of his set, as it very rarely strayed from the set he performed at Piknic Électronik in 2013, in temperatures much more suited to his style. But those looking for a nice, bass-heavy set that teetered on the edge of deep house and techno were rewarded by two hours that included tracks by Joris Voorn, Shadow Movement, as well as some of his own material — both released and unreleased — including tracks from his stellar debut, Chromophobia. Visuals at the main stage were handled by local VJ Patrick Trudeau, aka Diagraf, who is no stranger to the Igloofest experience, having participated for the last few years. While they could have been somewhat more dynamic, he did manage to accompany the low-key vibe of the evening. Lazy Days Recordings took over at the smaller Vidéotron Stage, with Fred Everything offering up the perfect pump-up jams to counteract the main stage, keeping the small tight-knit crowd jumping, which is oh so necessary when the night is cold enough to make your phone battery die in a matter of minutes. And with Friday being only the first of 12 Igloofest nights, there's still plenty more to look forward to, with artists spanning the multiple electronic sub-genres over the next four weeks.